The Napoleonic Wars (1803-1815) were a time of tremendous social upheaval in Europe, but brought much economic prosperity to Newfoundland and Labrador. The withdrawal of warring nations from the saltfish trade gave the colony an almost complete monopoly over the lucrative industry, while rising fish prices and high catch rates saw profits soar. Britain's 1809 military alliance with Spain and Portugal also prompted both countries to grant preferential treatment to British imports, which included Newfoundland and Labrador saltfish. As wages and standards of living rose, so too did Newfoundland and Labrador's permanent population. By the end of the war, the centuries-old migratory fishery gave way to an expanding resident operation, while a new spring seal industry broadened the colony's economic base and helped provide year-round employment. 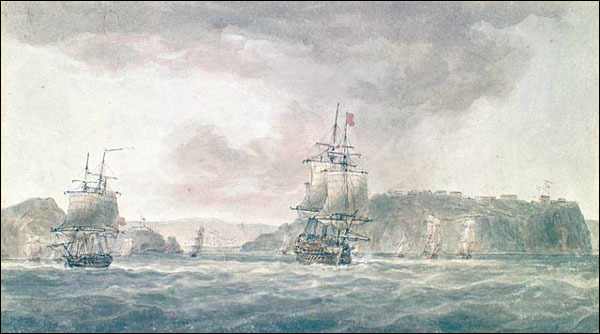 Titled “Outside view of the Harbour of St. John's,” the watercolour is attributed to Nicholas Pocock. Courtesy of Library and Archives Canada (Acc. No. 1970-188-643). Peacetime, however, plunged Newfoundland and Labrador into an economic depression. France, America, and other countries reentered the saltfish trade and ended the colony's monopoly. Many nations also imposed high duties on imports and paid bounties to subsidize their fishing industries, which made the fisheries of Newfoundland and Labrador less competitive. A string of harsh winters and poor fishing seasons intensified economic hardships for local residents, making poverty and destitution widespread in the early years after the war. Eventually, the seal industry and new fisheries off the Labrador coast helped stabilize the local economy. The Napoleonic Wars spanned 12 years and encompassed a series of conflicts between Napoleon's French Empire and a variety of European nations, primarily Britain. Prominent among these battles were the Peninsular Wars of 1807-1814, in which Spain, Portugal, and Britain fought against France. Although primarily a European conflict, the Napoleonic Wars created tensions between Britain and the United States, which resulted in the Anglo-American War of 1812-1814. This conflict was largely due to restrictions Britain placed on America's commerce with France during the Napoleonic Wars, as well as its practice of searching US merchant vessels for deserters from the British Royal Navy. Although no actual fighting occurred at Newfoundland and Labrador, the Napoleonic and Anglo-American Wars introduced dramatic changes to its economy and society. 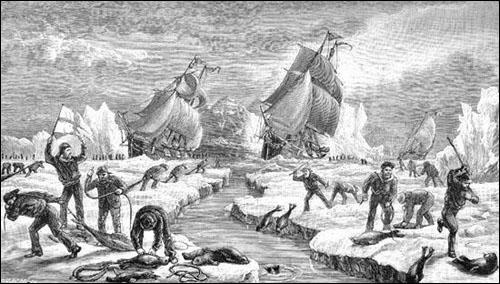 For three centuries leading up to hostilities, Newfoundland and Labrador served as a seasonal residence for European fishers engaged in the transatlantic migratory fishery. Shiploads of fishers arrived each spring, spent a few months catching cod, and then departed for Europe in the fall. France dominated the industry in the 16th and 17th centuries before it became an overwhelmingly British endeavour during the 1700s. As the 18th century wore on, the island's year-round population slowly increased and also engaged in the fishery, although not to the same extent as migratory fishers. 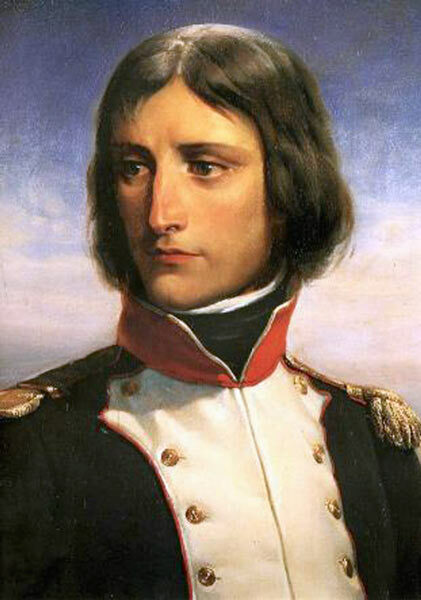 The English translation of the Wikimedia caption reads "Napoleon Bonaparte in 1792, Lieutenant-Colonel of the 1st Battalion of the Corsican National Guards." The Napoleonic Wars spanned 12 years and encompassed a series of conflicts between Napoleon's French Empire and a variety of European nations. Painted in 1835 by Henri Félix Emmanuel Philippoteaux (1815-1884). Licensed under Public Domain via Wikimedia Commons. This finally reversed during the Napoleonic Wars, as the resident population expanded at an unprecedented rate, while the migratory fishery contracted rapidly. These changes were prompted in part by the dangerous and volatile nature of maritime trade during the wars, alongside the tremendous pressure hostilities placed on British naval forces. England recognized its fishers were vulnerable to enemy attack while crossing the Atlantic and scaled back the number of men and vessels it sent to Newfoundland and Labrador each year. It also sought to strengthen military forces by recruiting skilled seamen from the migratory fishery into the Royal Navy, which grew from about 20,000 men before the wars to approximately 140,000 by 1810. Conversely, the number of British ships engaged in the transatlantic fishery decreased from about 300 in 1792 to less than 50 in 1817 and to 15 in 1823. At the same time, Newfoundland and Labrador's permanent population steadily increased during the wars as immigrants arrived to both avoid enlistment into British military forces and engage in the colony's growing resident fishery. Britain's wartime practice was to forcibly seize, or “impress,” men for service in its navy. Unlike elsewhere in the British Empire, fishers working at Newfoundland and Labrador were exempt from impressment. This made the colony an attractive refuge for individuals wishing to avoid military service and the hazardous transatlantic migratory fishery. As the resident fishery expanded and enjoyed economic success, it attracted additional immigrants to Newfoundland and Labrador. Although previously a minor endeavour, the resident fishery experienced much prosperity during the war years as competing nations withdrew from the fish trade. Both France and Britain tried to weaken each other by disrupting their trade and commerce with foreign nations. In November 1806, Napoleon forbade all of France's allies and conquests from engaging in trade with Britain. In response, Britain's Royal Navy began to attack and seize all shipping entering France. Raids on American vessels prompted the United States, a neutral country, to suspend all trade activities with foreign nations in 1807, including its sizeable saltfish exports to European ports. As Newfoundland and Labrador's chief competitors withdrew from the saltfish trade to either reinforce their navies or avoid attack, its resident fishery flourished. The colony acquired an almost compete monopoly over the sale of saltfish to important international ports, including those in Spain, Portugal, and the British West Indies, and its saltfish exports steadily increased from 625,519 quintals in 1805 to 1,182,661 in 1815. By then, resident fishers produced almost all the fish Newfoundland and Labrador exported overseas. At the same time, wartime demand for saltfish caused prices to nearly triple between 1805 and 1813, which resulted in higher wages for resident fishers – splitters, for example, saw their incomes jump from about £30 per season before the war to as much as £140 in 1814. The seal industry also emerged as a new source of income for residents during the spring and late winter, allowing them to supplement earnings from the summer cod fishery. Illustration by Percival Skelton. From Joseph Hatton and M. Harvey, Newfoundland, the Oldest British Colony (London: Chapman and Hall, 1883) 304. Commercial prosperity and high wages attracted growing numbers of migrants to Newfoundland and Labrador, and its permanent population almost doubled from 21,975 in 1805 to 40,568 in 1815. Although food imports into the colony were not always enough to sustain its rising population, high wages and a booming fishery resulted in higher standards of living than ever before. Merchants increasingly operated out of Newfoundland and Labrador instead of Britain's West Country, which allowed more of the money the fishery generated to remain in the colony. Economic prosperity and population growth fueled social and political change. The colony acquired its first newspaper in 1807, a volunteer fire brigade in 1811, and a constabulary in 1812. Advocates for political reform became increasingly active after 1811, and their efforts eventually led to the establishment of representative government in 1832. St. John's emerged as an administrative and military centre, where new employment opportunities existed for artisans, retailers, and a variety of other workers. Trade activity steadily increased at the town's secure and relatively large harbour, while its population jumped from about 5,000 in 1805 to 10,000 in 1813. Despite enjoying great economic prosperity during the wars, Newfoundland and Labrador sank into a depression once peace was restored in 1815. France, America, Norway, and other countries reentered the saltfish trade and competed with Newfoundland and Labrador for valuable markets and resources. Prices for saltfish dropped to prewar levels and many nations introduced duties, or taxes, on the importation of foreign fish and other products, which further reduced Newfoundland and Labrador's declining profits. Hardships forced some merchant firms to close and unemployment increased rapidly. A series of harsh winters between 1815 and 1817 made living conditions even worse for residents, while fires at St. John's during the winter of 1817 left thousands homeless. That spring, dangerous ice conditions grounded the island's sealing vessels and eliminated a much-needed source of income for already destitute families. Widespread poverty, hunger, and suffering resulted in public discontent and the looting of some stores. The following year returned Newfoundland and Labrador to a more sound financial footing. The seal hunt was a success, local cod fisheries were expanding to Labrador's inshore waters, and international markets were generally sound. Although the colony never enjoyed the same level of profits it reaped during the wars, it acquired fairly consistent markets for its saltfish in Brazil, the West Indies, and in the southern European ports of Spain, Portugal, and Italy. By the end of the wars, Newfoundland and Labrador's resident fishery was firmly entrenched and would drive the colony's economy for the rest of the century.